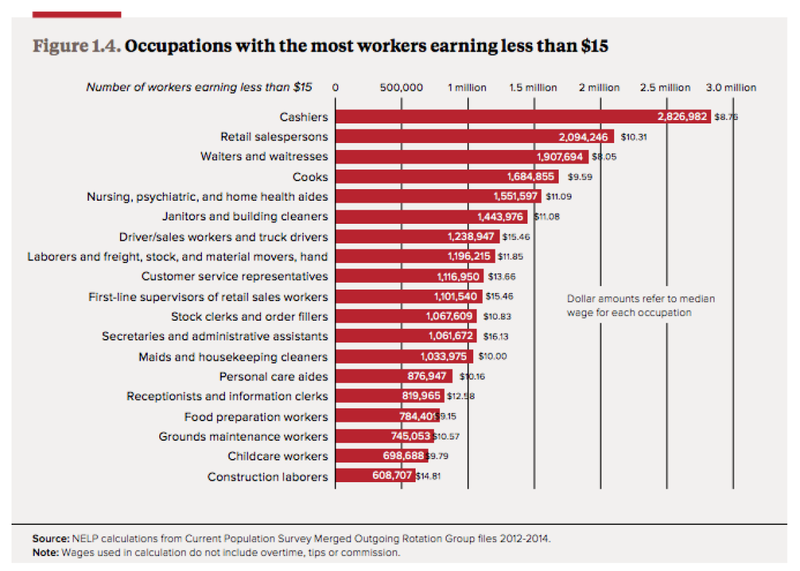 How many workers earn less than $15 per hour. 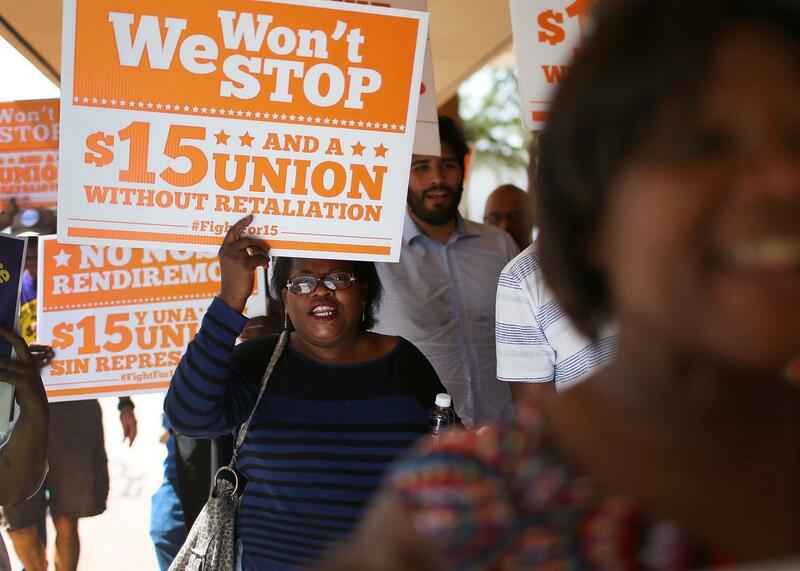 A $15 Minimum Wage Would Give Almost Half of American Workers a Raise. Is That Crazy? When economists debate the effects of increasing the minimum wage, they tend to focus on service industries like fast food and retail that we all associate with rock-bottom pay. But with the national movement for a $15 minimum gaining steam—California, here it comes!—it’s worth keeping in mind that this isn’t really just a conversation about McDonald’s and Old Navy employees anymore. According to the National Employment Law Project, 42.4 percent of American workers currently make less than $15 an hour. There are around 1.4 million janitors and cleaners who earn below that mark, 1.2 million drivers, 1 million secretaries and administrative assistants, and 699,000 child care workers. We’re talking about a policy change that will affect how much it costs to put a kid in day care, run an office, or build an office tower. We’re talking about a raise for nearly half the country. This is, of course, precisely why some people find the idea of a $15 minimum so appealing: It would mean higher pay for a nice cross-section of the working class. But tinkering with four-tenths of the job market is also inherently risky, since many industries that aren’t typically affected by a minimum wage increase would suddenly see their labor expenses rise. That makes it tricky to predict how many job losses the policy might lead to. Maybe McDonald’s would be able to shoulder the personnel costs. But it’s possible some of the estimated 5.3 million American manufacturing jobs that pay less than $15 per hour would end up overseas. Maybe Walmart would be able to figure out ways to pay its associates more without cutting hours, but offices might cut back on secretaries as an unaffordable luxury. None of this necessarily means that the Fight for 15 movement is misguided. But it’s a reminder that the push is more of an economic gamble than some of its supporters might like to admit.